Actual poster size is 30 x 39 7/8 inches (31 x 41 inches including linen-backing). 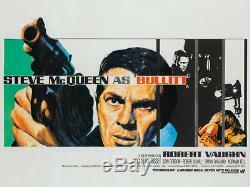 The item "Original Bullitt, UK Quad, Film/Movie Poster 1968, Chantrell" is in sale since Wednesday, February 14, 2018. This item is in the category "DVDs, Films & TV\Film Memorabilia\Posters\Originals - UK Quads\Pre-1970". The seller is "orsonandwelles" and is located in Bath.